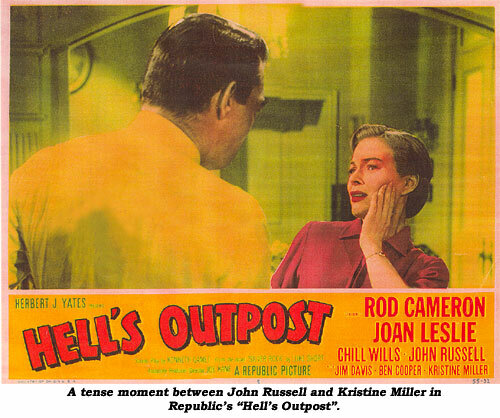 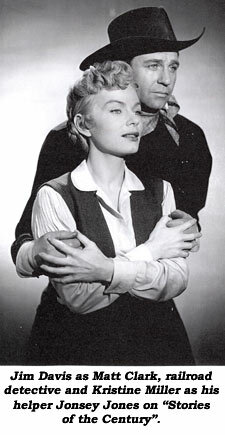 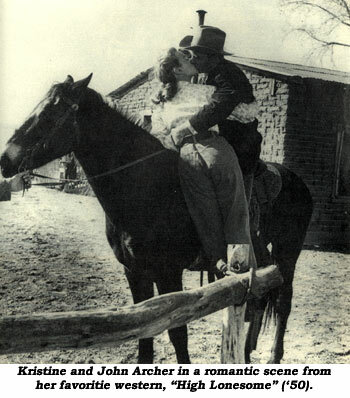 Statuesque and striking—two adjectives that describe Kristine Miller, the movie star of the ‘40s and ‘50s who went on to co-star in a fondly recalled Emmy award winning western series, “Stories of the Century”. 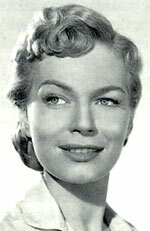 Born Jacqueline Olivia Eskeson (circa 1925) in Argentina, the youngest daughter of an American mother and Dutch father, the family left South America in 1933, after that branch of the Standard Oil Company failed, moving to Copenhagen and eventually the States in ‘39—shortly before Nazis took over. 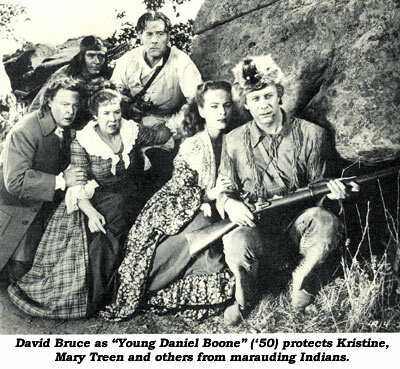 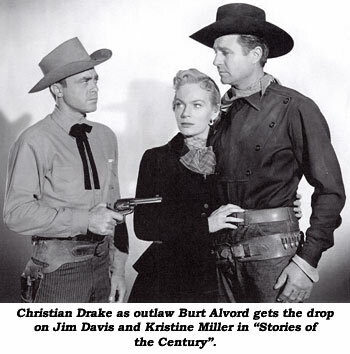 Movies: Desert Fury (‘47 Paramount)—John Hodiak; High Lonesome (‘50 Eagle Lion)—John Barrymore Jr.; Young Daniel Boone (‘50 Monogram)—David Bruce; Hell’s Outpost (‘54 Republic)—Rod Cameron; Thunder Over Arizona (‘56 Republic)—Skip Homeier; Domino Kid (‘57 Columbia)—Rory Calhoun; The Persuader (‘57 WorldWide/Allied Artists)—William Talman. 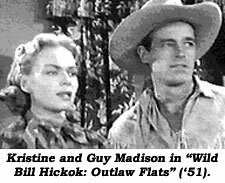 TV: Wild Bill Hickok: Outlaw Flats (‘51); Stories of the Century: Henry Plummer (‘54); Stories of the Century: 13 episodes (‘55); Restless Gun: Torn Flag (‘58); Wagon Train: Rex Montana Story (‘58); Texan: Gunfighter (‘59); Texan: Accuser (‘60); Tales of Wells Fargo: Prince Jim (‘61).